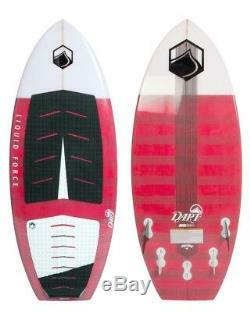 Liquid Force Dart Wakesurfer 2017. If youre looking for a fast, loose, and light surf-style wake surf board, the new DART may be just the right ride for you! We took what was already a great board and made it better for 2017. The new DART comes with a wider tail, slightly lower tail rocker and increased nose rocker, making it much faster with more glide than last year. In addition, these changes make it easier to turn with less hang-ups at the nose. With a lightweight EPS construction that is topped with a reinforce deck and carbon stringers, this board is built to perform and built to last! CNC milled / hand finished lightweight EPS wood stringered core. Dual layer top glass w/ Innegra tail reinforcement. Single layer base glass w/ Carbon stringer. Wide Squaretail w/ Single Concave Hull. Square Grooved EVA Front & Rear Deck Pad w/ molded kickstop and archbar. Five Fin Option - comes w/ 2 large side fins, 2 Stubbie 2.0s, and 1 center fin. 46.0 116.9 cm. 19.5 49.5 cm. 2.9" N/0.9" T 7.5 N/2.3 cm T. Up to 130 lbs Up to 59 kg. 52.4 133.2 cm. 21.0 53.3 cm. 3.1" N/0.9" T 7.8 N/2.4 cm T.
Up to 180 lbs Up to 82 kg. 56.4 143.3 cm. 21.5 54.6 cm. 3.3" N/1.0" T 8.5 N/2.6 cm T. 150 - 200 lbs 68 - 91 kg. 63.5 161.4 cm. 22.0 55.9 cm. 3.8" N/1.2" T 9.6 N/3.1 cm T. 190 - 250+ lbs 86 - 114+ kg. Listing and template services provided by inkFrog. The item "Liquid Force Dart Wakesurfer 2017" is in sale since Thursday, January 5, 2017.